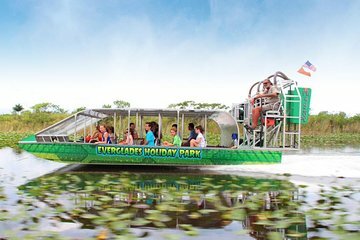 Få adgang til dybden af ​​Everglades National Park på en flybådstur, der inkluderer rundturstransport fra Miami. Spring over besværet med at leje en bil og nyd afhentning og drop-off i Miami Beach, så overfør til Everglades for en omfattende tur, der omfatter en airboat ride og et pædagogisk alligator show. Lær om det unikke økosystem og dets dyre- og plantebefolkninger gennem din guides indsigtige kommentar. Tour guides were very informative. Entertaining commentary. Tour was very well organized and followed a schedule. Really happy with what we got for the price. Round trip transport, photo, 1 hour air boat with excellent guide Captain Charlie. Alligator show with lots of info and chance to hold baby gator (additional fee) Only 30mins to walk around after show and would have liked more but great trip overall. They did pick us up at our hotel and played a National Geographic video on the Everglades on the 40 minute drive to the air boat tour didn't have time for the video to finish. Once we arrived we only waited 10 minutes for the air boat ride. The air boat had five rows of seat, with four people per road. The air boat went slow through a channel looking for wildlife. They provided ear plugs which we needed to use when they accelerated in the open swamp, then they returned through the channel. The guide did give some information on the plants, birds and wildlife in the area. We saw four alligators, only one out of the water for a good view a few turtle and a number of birds. However, the tour said 1 hour ride, it was more like 35-40 minutes. The alligator show was about 15 minutes but nothing spectacular. They had an area where they kept alligators to view through a fence after the show. They had a gift shop and snack bar, which we didn't use. We went to the shuttle bus but he said we'd be taking another shuttle back for some reason. We had to wait another 30 minutes for that shuttle to leave. The experience wasn't exactly what we expected and would probably not do it again.